In a multi-master configuration, many suppliers can accept updates, synchronize with each other, and update all consumers. The consumers can send referrals for updates to all masters. Directory Server supports 20-way multi-master replication, meaning that there can be up to 20 masters (and an unlimited number of hub suppliers) in a single replication scenario. Directory Server allows an unlimited number of consumers. To set up multi-master replication, set up all of the consumers first, then set up the suppliers, and last, initialize all of the databases. More than 10 databases running with replication or more than on a supplier can cause performance degradation. To support that many consumers, introduce hub replicas between the suppliers and consumers. See Section 15.7, “Configuring Cascading Replication”. Set up each supplier server. 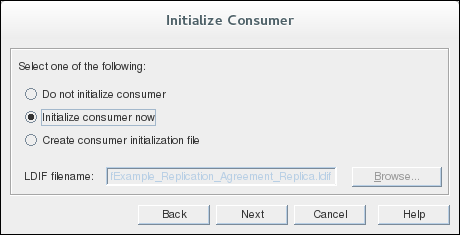 The first supplier configured should be used to initialize the other suppliers in the multi-master replication environment. Create the entry for the supplier bind DN on the consumer server if it does not exist. This is the special entry that the other suppliers will use to bind to this supplier, as in other supplier-consumer relationships. This is described in Section 15.4, “Creating the Supplier Bind DN Entry”. For multi-master replication, it is necessary to create this supplier bind DN on the supplier servers as well as the consumers because the suppliers act as both consumer and supplier to the other supplier servers. 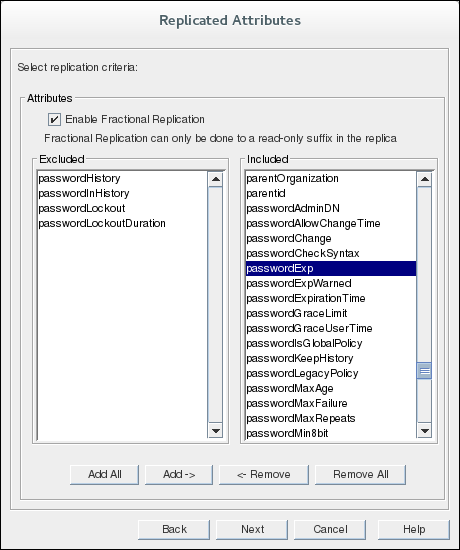 Specify the replication settings for the multi-mastered read-write replica. 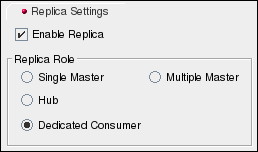 In the Replica Role section, select the Multiple Master radio button. Specify the LDAP URL (ldap://hostname:port or ldap://IP_address:port, with IPv4 or IPv6 addresses) for any supplier servers to which to refer updates, such as the other suppliers in the multi-master replication set. Only specify the URL for the supplier server. For clients to bind using TLS, specify a URL beginning with ldaps://. First, configure every consumer before creating any replication agreements. 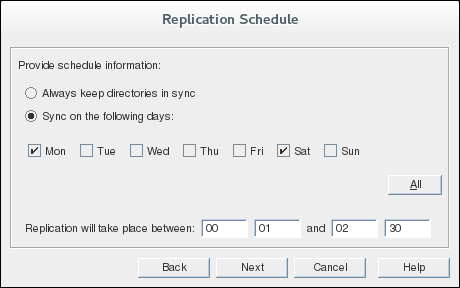 Repeat these steps for every consumer server in the replication configuration. First set up replication agreements on a single supplier, the data master, between the other multi-master suppliers, and initialize all of the other suppliers. 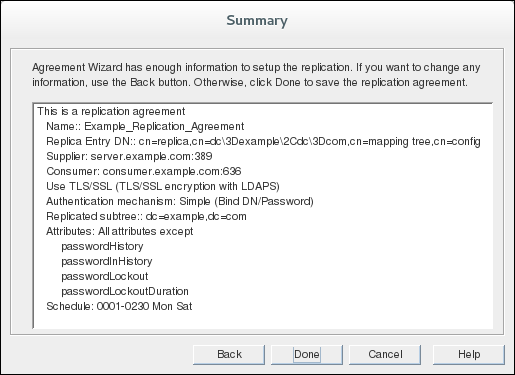 Then create replication agreements for all other suppliers in the multi-master replication set, but do not reinitialize any of the suppliers. Then create replication agreements for all of the consumers from the single data master, and initialize the consumers. Then create replication agreements for all of the consumers from for all of the other suppliers, but do not reinitialize any of the consumers. Unless there is more than one instance of Directory Server configured, by default, there are no consumers available in the drop-down menu. The server URL can be entered manually, in the format hostname:port or IP_address:port, with IPv4 or IPv6 addresses. If attribute encryption is enabled, a secure connection is required for the encrypted attributes to be replicated. Configuring TLS and certificate mapping is described in Section 9.4, “Enabling TLS”. Ensure one supplier has the complete set of data to replicate to the other suppliers. Use this one supplier to initialize the replica on all other suppliers in the multi-master replication set. Initialize the replicas on the consumer servers from any of the multi-master suppliers. Do not try to reinitialize the servers when the replication agreements are set up. For example, do not initialize server1 from server2 if server2 has already been initialized from server1. In this case, select Do not initialize consumer. The replication agreement is set up. At the end of this procedure, all supplier servers will have mutual replication agreements, which means that they can accept updates from each other. 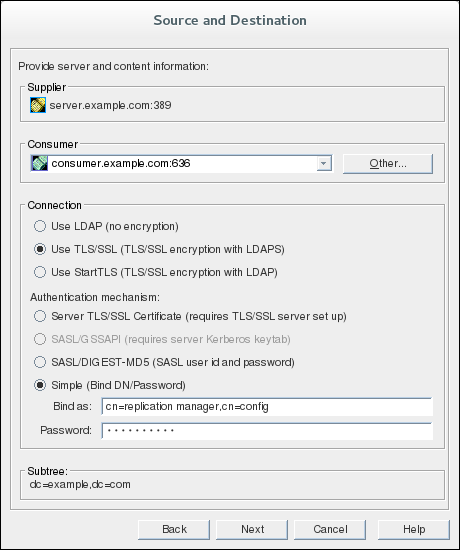 After creating a replication agreement, the connection type (TLS or non-TLS) cannot be changed because LDAP and LDAPS connections use different ports. 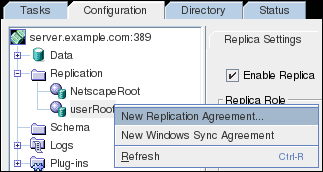 To change the connection type, re-create the replication agreement. One of the features of multi-master replication is that a supplier acquires exclusive access to the consumer for the replicated area. During this time, other suppliers are locked out of direct contact with the consumer. If a supplier attempts to acquire access while locked out, the consumer sends back a busy response, and the supplier sleeps for several seconds before making another attempt. During a low update load, the supplier sends its update to another consumer while the first consumer is locked and then send updates when the first consumer is free again. A problem can arise if the locking supplier is under a heavy update load or has a lot of pending updates in the changelog. If the locking supplier finishes sending updates and then has more pending changes to send, it will immediately attempt to reacquire the consumer and will most likely succeed, since the other suppliers usually will be sleeping. This can cause a single supplier to monopolize a consumer for several hours or longer. Sets the time in seconds a supplier waits after a consumer sends back a busy response before making another attempt to acquire access. Sets the time in seconds a supplier waits between two update sessions. If you set a value lower or equal than the value specified in nsds5ReplicaBusyWaitTime, Directory Server automatically uses a value for the nsds5ReplicaSessionPauseTime parameter, that is one second higher than the value set in nsds5ReplicaBusyWaitTime. Sets the timeout after which a master will release the replica, whether or not it has finished sending its updates. This prevents a single master from monopolizing a replica. For further details, see the parameter descriptions in the Red Hat Directory Server Configuration, Command, and File Reference. To log replica busy errors, enable Replication error logging (log level 8192). See Section 20.3.7, “Configuring Log Levels”.